Continuing along Highway 99 from Horseshoe Bay you will pass through Squamish, Garibaldi Provincial Park, Whistler and on to the Duffey Lake Road which will take you to Lillooet and the Cariboo-Chilcotin. The Squamish Highway also known as the "Sea to Sky Highway", is a very scenic route which follows the Howe Sound shoreline. Once a large producer of copper, the mine was permanently closed in 1974. Within this National Heritage Site is the BC Museum of Mining which offers guided underground tours. From Britannia Beach continue on to Shannon Falls Provincial Park, which is six times the elevation of Niagara Falls and provides good hiking and picnic areas. Next is The Stawamus Chief, with some 180 rock climbing route. The Stawamus Chief is said to be the second largest piece of granite in the world (Gibraltar is first). Squamish is situated at the head of the Howe Sound and overlooks Mount Garibaldi and the Stawmus Chief. The region is a prime windsurfing and rock climbing area. From this point on to Whistler are a number of trails to Garibaldi Provincial Park. Visitors may ride the Royal Hudson from North Vancouver to Sqaumish and return by boat on the MV Britannia. The 1940's Royal Hudson coaches are pulled by a 1940's steam engine. This world renowned all-season resort centre is 120km (74miles) north of Vancouver. 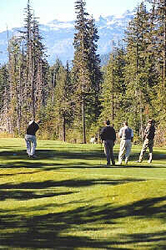 Originally called Alta Lake, it catered to people interested in outdoor activities. In 1965 the area became more popular after the highway was constructed and Whistler Mountain opened for skiing. In 1975 a plan for Whistler Village was developed. Whistler and Blackcomb are located in the Coast Mountains and provide more than 200 down hill ski runs and 27 lifts. There is also excellent cross-country skiing, heli-skiing, snowmobiling and sleigh rides. In the summer visitors enjoy activities such as windsurfing, fishing, boating, canoeing, swimming, golfing and hiking on the many miles of trails. In winter the lifts are for skiing, in the summer for hiking. This is an 18-hole scenic course designed by Arnold Palmer. This is the biggest resort-hotel in Canada since the turn of the century. 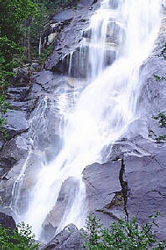 Continuing along Highway 99 to Lillooet you will pass by Nairn Falls Provincial Park with nearly 90 campsites and good fishing in the Green River. This mountain farming village offers visitors a chance to go fishing, golfing, river rafting, hiking and horseback riding. Pemberton is 32 km (20 miles) north of Whistler via Highway 99. The museum features of the Fraser River gold-rush exhibits and local native artifacts. These three pools are accessed via a part paved/part gravel road through Pemberton Meadows. This natural and undeveloped hot springs is south on the Lillooet River. From Pemberton you may wish to visit the Hurley Pass which follows along Lilloet to Gold River. This is a two-hour (80 km or 50 miles) journey from Pemberton. 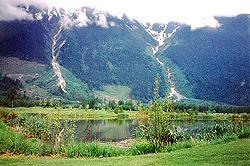 Also worth a visit is D'Arcy at Mount Currie or continue along the Duffy Lake Road to Lilloet to the Cariboo region. The road to D'Arcy is paved and takes you to Birken, and Birkenhead Lake Provincial Park and finally D'Arcy. From here there is a 4 x 4 road to Seton Portage and the Bridge River Road into Lillooet. East of Pemberton on Highway 99 is the beautiful Mount Currie. The Duffy Lake Road starts just past here and provides impressive views of the Coast Mountains. Lilloet is 85 km (53 miles) from here. Once the second largest city north of San Francisco, Lillooet was the terminus of the boat route through Harrison and Anderson Lakes, and mile 0 on the first Cariboo Road. In the 1860's "Hanging" Judge Matthew Begbie handed out justice from this locale. 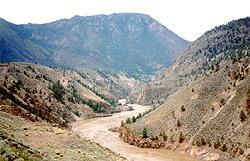 There are almost 350 sites in and around Lillooet providing detailed history of the Upper Lillooet Indians. From Lillooet you may travel Highway 99 until you reach Highway 97 (the Cariboo Highway) at Hat Creek Ranch or continue southeast from Lillooet on Highway 12, ad it winds along the Fraser River to Lytton and the TransCanada Highway (Highway 1).